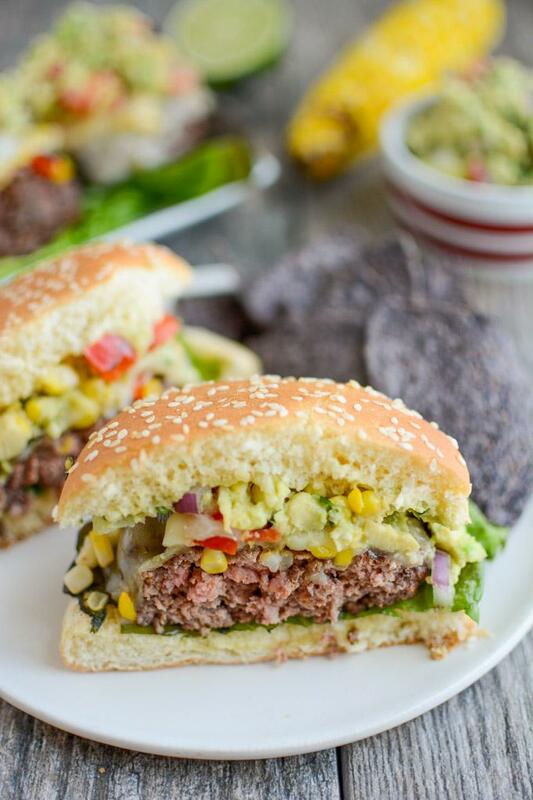 These Mexican Burgers are perfect for your summer cookout or party. 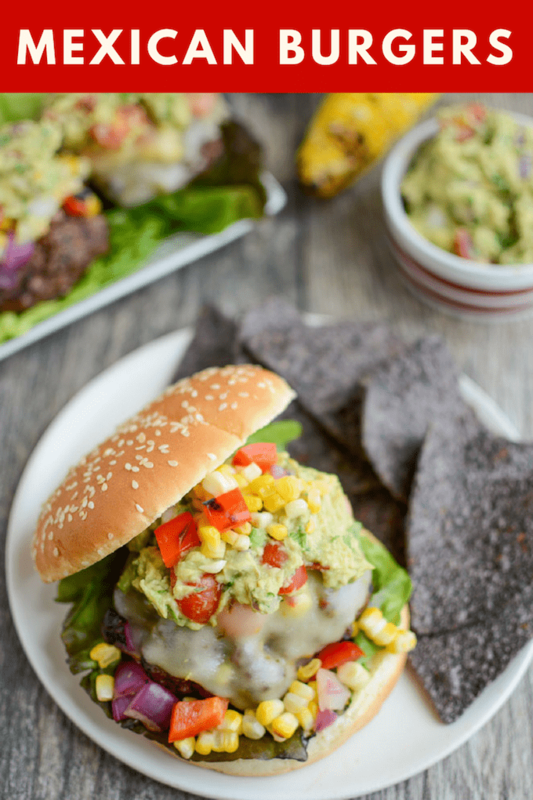 Topped with grilled corn salsa, pepper jack cheese and lots of guacamole, each bite is packed with flavor! Are you drooling over these burgers yet? If not, you should be! They are most certainly a new favorite around here. I’m not actually a huge burger girl myself…but my husband is and he seems to have passed his love along to Squish as well. When I told him I was on a mission to develop a delicious new burger recipe, he immediately suggested a Mexican inspired burger. We both immediately agreed on pepper jack cheese and LOTS of guac and after some deliberation, we decided on a grilled corn salsa to pull it all together. We’ve tested these burgers a few times now to make sure we perfected them before sharing with you guys and a few weeks ago, my husband had a strong craving for a lunchtime burger. I had a busy morning with the kids and no chance of making it to the store…but what I did have was a mom’s secret weapon: Meijer Home Delivery. I pulled up the shopmeijer app on my phone and ordered all of the burger ingredients and they were delivered right to my door leaving us plenty of time to make them for lunch! Something else to think about: Say you made last minute plans with some friends for a get-together at their house and no one had any food prepared. 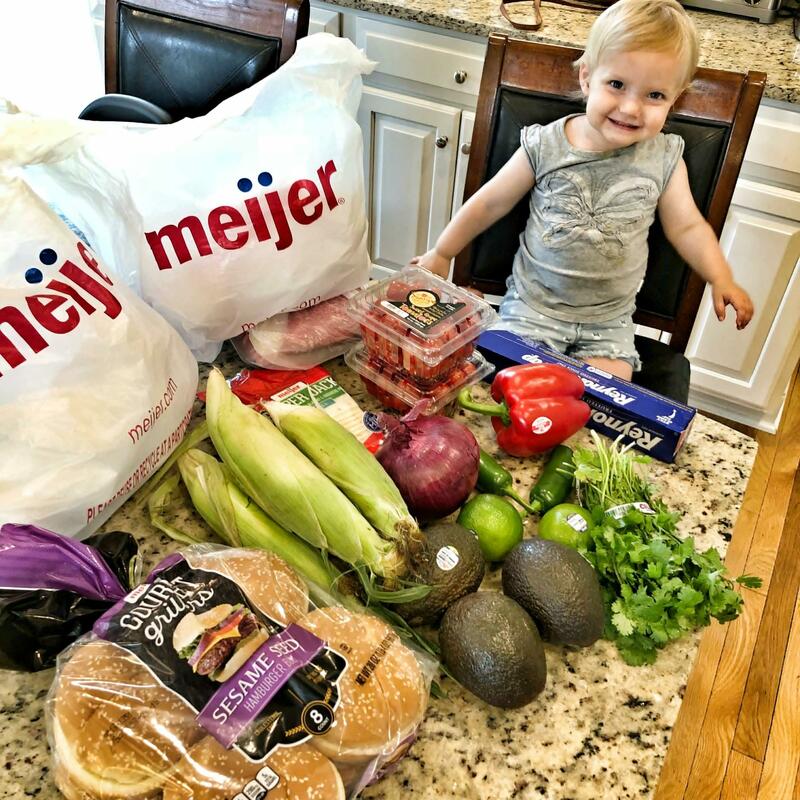 You could easily use the shopmeijer app to order what you need and get it delivered to your friend’s house for a cookout! Or if both you and your spouse work outside the home and you need ingredients for dinner the next day, set up a 6am delivery so it’s taken care of before you leave for work! Check out Meijer Home Delivery here. Now back to the burgers! So, our ingredients were delivered to our front door in plenty of time for lunch and then it was all hands on deck to get them ready. I prepped the burgers (a simple mix of Certified Angus Beef® brand ground beef and your favorite taco seasoning) while Little Miss had fun peeling the corn (ie throwing corn husks all over the kitchen floor). 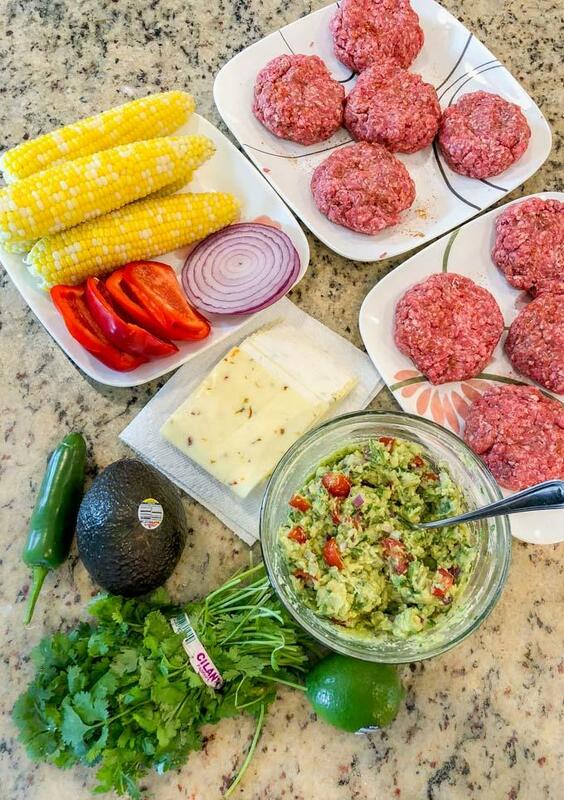 When my hubby came home from work, he grilled the veggies and the burgers while I made the guacamole and the corn salsa. When everything was done, we popped them on our favorite Meijer Gourmet Griller buns and dug in. Squish took the position of official taste tester. Steam corn on the stovetop or in the microwave and set aside. Slice red pepper into 4 sections and remove the seeds and stem. Grill corn, peppers and onion rings for a few minutes until slightly charred. While burgers are cooking on one side, cut the corn off the cob, dice the red pepper and onion and mix with 1/2 cup cherry tomatoes and juice from one lime. 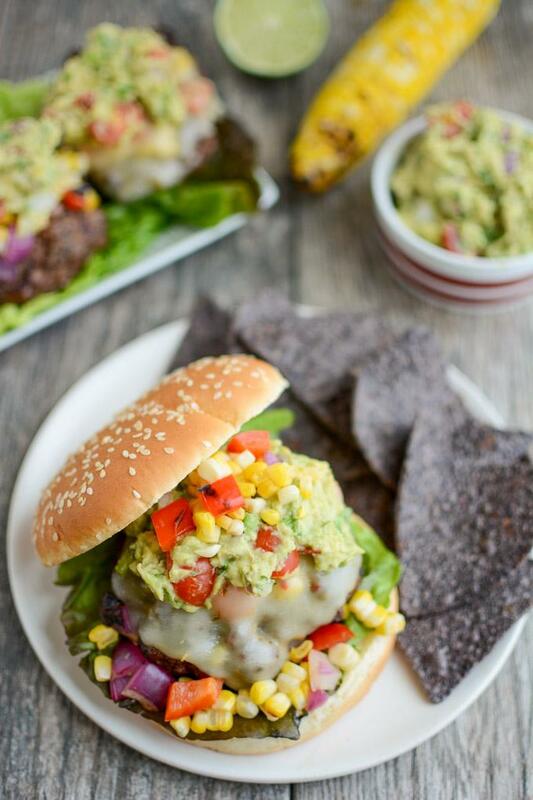 Flip burgers and top with corn salsa, then top with cheese and finish cooking. Make guacamole by mashing avocados and mixing with 1/2 cup diced red onion, 1/2 cup cherry tomatoes, cilantro and juice from one lime. 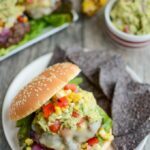 Place burgers on Meijer Gourmet Griller buns, top with guacamole and serve. This recipe works best with two people so one can be manning the grill while the other makes the salsa and the guac. Be sure to let us know if you try these burgers this summer! Hopefully they’ll be a new favorite for you too! These sound amazing!! Perfect for a BBQ by the pool!